The Cambridgeshire team put in a good performance in this weekends National County Championships in Bristol. We reached the semi-finals before loosing to eventual winners, Kent. Flooding caused havoc with our traffic plans. Matt Hope set off Friday night with Adam, Helen and Nish. But his flooding caused huge traffic delays and Matt's car subsequently overheated leaving them stranded in Birmingham. I managed to collect Adam, Helen and Nish from Birmingham on Saturday morning, but Matt had to pull out to sort out his car, leaving us a boy down. Rachel C & Dave T faired even worse. They too went down Friday night, but ended up stuck on the M5 overnight (with their 2 kids in the car). We did all eventually make it for the delayed start of the tournament, which was played on heavily water-logged pitches (literally puddles on the grass in places). The 14 teams that entered were split into two qualifying groups of 7. We came 2nd in our qualifying group behind Nottingham. In the group stage we scored convincing wins over North London & Oxfordshire, had a narrow win over a surprisingly strong West Midlands side (they had various London-based players playing for them) and a slighty dissapointing draw against a West Yorkshire team who were were clearly better than, but in the conditions we couldn't quite prove it (and two dodgy penalties didn't help). 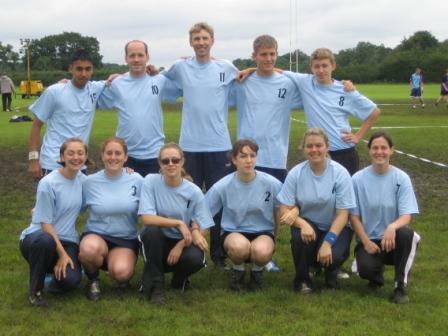 In the last game of the day we took on Nottingham on a pitch where one end was pretty much just wet brown mud. As soon as they decided to attack into the better end (no half-time, so no change of ends), were were always going to struggle. We defended valiantly, but just couldn't score the goals against their qualty players in the conditions. In the end we lost 4-2. We then played a 3rd place play-off against Norfolk (that had all the best Knights & City players). We decided to use this game as a chance to give a start to some of the people who only been subs so far on Sunday, and they did well, leading for most of the match. However, Norfolk finished strongly and and pulled the game back level, and nearly pinched it at the end. With the scored finishing even, it came down to the a penalty shoot-out, which unfortunately they won. Special mention must go to Nish Dabhi. If Matt had played, he would probably have only been our 5th choice boy, but he ended up being our player of the tournament. He was our top scorer with a fantastic array of goals, looked comfortable defending against the best players and brought great creativity and energy to the team. Thanks to everyone who played (espec. Carla & Sara who helped organise).. and also to Reda for running a couple of pre-tournament training sessions for the squad.